The Fourth Judicial District Commission on Judicial Performance recommends, by a vote of 5-3 that Judge Christopher Edward Acker BE RETAINED. Judge Acker graduated from the University of Northern Colorado in 1981 with a Bachelor’s degree in Business Administration. Thereafter, he attended law school at the University of Santa Clara where he graduated in 1987. Prior to becoming a judge, he worked as an Associate Attorney for the law firm of Hecox, Tolley, Keene and Beltz P.C. He also was in private practice where he focused on real estate and juvenile law. 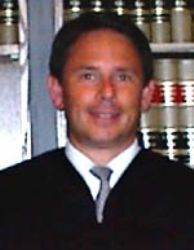 Judge Acker was appointed to the bench in March 2003. Of note, Judge Acker was a founding member of the Personal Recognizance Bond Committee, which created and developed the personal recognizance bond process for the 4th Judicial District. He was also selected as President of Colorado County Court Judges Association and as President for the Trial Judges Council for the Colorado District and County Court Judges. Judge Acker participated in a self-evaluation program and submitted written opinions to the Commission. He was also observed in court proceedings and was interviewed in person by the Commission. Judge Acker is currently the liaison for the Useful Public Service. Judge Acker was evaluated by 137 attorneys and 197 non-attorneys over a 4-year period. Among the attorneys 64% recommended that he be retained, 29% recommended not to retain and 8% made no recommendation regarding retention. Among the non-attorneys 80% recommended that he be retained, 13% recommended not to retain and 6% made no recommendation regarding retention. (These percentages may not total 100% due to rounding). Judge Acker was rated below average for all judges during this rating period by attorneys and non-attorneys alike. He was also rated below average in the criteria of Case Management, Application and Knowledge of the Law, Communications, Demeanor and Diligence. Similarly, he was also seen as a judge with a bias for the prosecution. A majority of Commission members was satisfied that he should be retained. However, a minority of Commission members felt that he met only the minimum standards.